Drift the Colorado River through the Grand Canyon and you enter a cathedral that could only have been built by the hand of God. It is a journey of an infinite variety of colors and hues, where no view or form is ever duplicated. Here, on the cool running river, the enormity and splendor of this great creation is revealed anew with every wind and turn. With "The Grand Expedition" William S. Phillips gives us a spectator’s view of a John Wesley Powell encampment on one of his expeditions through the uncharted canyons of this American treasure. Powell passed down this watercourse twice, first in 1869, then again in 1871-1872. He and his crews did so in specially designed dories that were state of the art designs for the day. Today, the idea of shooting the rapids of the uncharted Colorado in these tiny vessels inspires as much awe as the Canyon’s views themselves. Shapes, forms and colors rise and fall in countless arrays throughout William S. Phillips’ "The Grand Expedition." This artwork is available as both a 22” x 33” MasterWork™ Fine Art Canvas in an edition of only 25 or as a regular sized 18” x 27” Fine Art Canvas in an edition of 50. 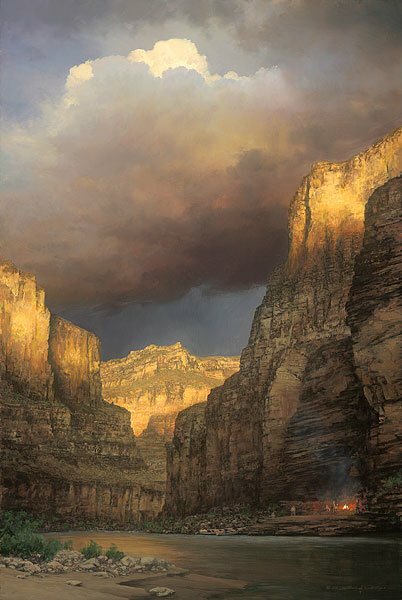 Each of these magnificent works of art captures a momentary glimpse of history and beauty that can only be found in the great American southwest.